Discover Salta during your fully customizable Argentina vacation. All of our Argentina tours have daily departures and are covered by our price guarantee. Located in the northwestern part of Argentina, this colonial quaint town bears the marks of the Spanish conquest visible in its architecture and atmosphere, making it a unique destination in Argentina. This colorful city boasts a fascinating heritage of which its congenial inhabitants are extremely proud of. A tour of Salta will allow you to explore the narrow paved streets lined with beautiful colonial buildings. Enjoy a cup of coffee on one of the terraces on the main square to get a feel for this lively provincial town. 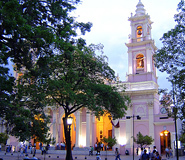 Salta boasts a particularly active cultural life as well as a busy night scene, assured to keep any traveler entertained. Salta is also the perfect base to launch excursions in the stunning surrounding Calchaqui valleys, filled with picturesque villages and spectacular landscapes. Travelers will revel in the valleys’ odd rock formations, deep ravines, and multi-colored lush hills that characterize this beautiful region. There are many opportunities for exciting adventure activities, including rafting, hiking, trekking, horseback riding, and more, as well as an interesting wildlife. If you are lucky, you might catch a glimpse of vicuñas, hawks, or pumas. City Tour. Visitors to Salta will find plenty of quaint and historic buildings characteristic of northern Argentina. The leafy Plaza 9 de Julio is a beautiful eclectic mix of Spanish colonial, baroque and neo-classical architecture, all wonderfully preserved. The atmosphere on the central square is especially pleasant on summer evenings, when live music from the central gazebo echoes off the buildings, and crowds of all ages gather on the grass beneath the tall palms and flowering trees. Standing just alongside the Plaza is the stunning, neo-classical Salta Catedral, built in the 19th century, and the Cabildo (City Hall). Admire the entire city nestled into the creeping vegetation of the surrounding Larma Valley from the imposing Cerro San Bernadino, accessible by a cable car. Tour to the Clouds. Journey on the Tren a las Nubes (Train to the Clouds), one of the highest railroads in the world, reaching 13,780 feet (4,200 meters) and passing through some of the most stunning landscapes available in northern Argentina, literally taking you above the clouds. You will travel across the valleys and catch a glimpse of the magnificent Jujuy salt flats and continue down the beautiful Cuesta del Lipan. Also not to be missed is a brief stop in Purnamarca on your return to Salta to visit the local indigenous crafts fair, lunch on some alpaca stew—a specialty of the area—and watch the red glow of the sunset light up the multicolored rock formation, known as the Seven Color Mountain, which makes this village famous. This tour can also be done driving on the roads that follow the train tracks. Wine tour. Over the last few years, the Calchaqui Valleys surrounding Salta have become famous for their exquisite wine production, of which the town of Cafayate is the epicenter. Introduced by Jesuits, the art of wine-making has greatly developed in the region, which now boasts excellent and internationally acknowledged wines. Many wineries offer tours and wine-tasting opportunities which will delight wine-enthusiasts. Situated at an altitude of 4,000 feet (1,200 meters), Salta enjoys a temperate weather throughout the year. The peak tourist months of July and August bring large crowds. 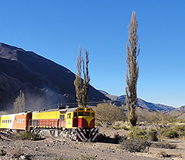 The Train to the Clouds operates from April to November, so the best time to visit Salta is April to May or October to November, when the crowds are low and the weather is especially pleasant. We had a fantastic time, everything went well with our tours and pick-ups. Argentina For Less was very efficient and very informative. We had a great time in Salta. The Tour to the Clouds and Cafayate were outstanding. The quote that comes to mind is "Life is not measured by the number of breaths you take but by the moments that take your breath away" - Hilary Cooper. That was certainly the case in the mountains. We would not hesitate to use you again. We had a wonderful vacation. Everything worked very well. All pick up arrangements without exception were on time. All flights were on time and each activity and visits were held as planned. All in all we are very satisfied with the program you put together for us and I would certainly not hesitate to recommend you as a professional organization. In fact we have already started to think about our next vacation!! Thanks again and hopefully we will be in touch in the near future. I am very grateful for your excellent job. You did everything very quickly and very carefully. I didn’t have any problems during my trip. Everything was very well organized. I will recommend Peru For Less to all my colleagues. I will use your agency next time. Hotel Boutique Legado Mitico was once the mansion of a Salta patrician, and is located deep in Salta's historic district. The hotel is steeped in legend, history, and myth, with each room named after heroes from Salta's past. The guestroom La Escritora, for example, is a tribute to Juana Manuela Gorriti, a fiery 19th century Argentine author. The rooms includes a small patio, wood-burning stove, and hydro-massage tub, as well as a flat screen TV, mini-bar, safe-deposit box, air-conditioning and heater, internet, and telephone. There is also a library, solarium, gift shop, gorgeous patio, and breakfast lounge. This hotel is socially committed to many projects, including RELAF, a child protection agency. The marvelous Hotel Patios de Lerma, located near Parque 20 de Febrero, only a few blocks away from Salta's historic district, is a stylish option for your Salta hotel. The décor is sophisticated, with sleek black paneling, natural wood furnishings, and gorgeous lighting. Each of the 31 rooms comes with a satellite flat screen TV, mini-bar, and safe-deposit box. Exquisite regional and international cuisine is served in the restaurant, and guests can also indulge in fine coffee and sweets in the cafeteria. Breakfast is served American buffet-style, with a great selection of breads and sweets, juices, and cereals. Other services include a spa, laundry, and an outdoor terrace with Jacuzzi.